Most of us think of acid reflux disease as something annoying, a nuisance. When someone hears the words "acid reflux" they generally think of it as the symptoms of stomach bloating, stomach gas and heartburn, usually caused by eating spicy food late at night. Often, we treat our heartburn by going to the local drugstore and buying over the counter medications such as Tums, Alka-Seltzer, Maalox, and Pepto-Bismol. "Plop plop, fizz, fizz the heartburn goes away so now I can continue on with my day." Alas, how we all wish it was that simple. The fact is that tens of millions of people have acid reflux without heartburn. How could that be? Dr. Jonathan E. Aviv, MD, FACS, a world-renowned physician, surgeon, educator, and inventor, and one of the leading authorities on the diagnosis and treatment of acid reflux disease, cough, and voice and swallowing disorders, draws upon his decades of medical experience, both in and out of the operating room, to bring you the real story of acid reflux disease and its devastating impact on the general public. 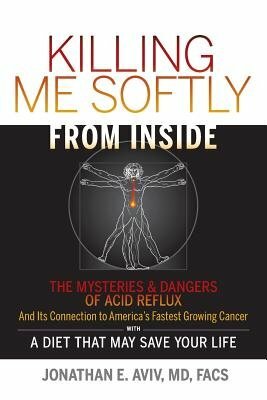 He explicitly and meticulously connects the extremely acidic, highly processed "food" Westerners eat, to acid reflux disease, and ultimately to esophageal cancer. This connection is a startling breakthrough and Dr. Aviv provides a solution with his Acid Watcher(r) Diet, a unique dietary program that combines low acid foods along with the three macro-nutrients with a high fiber component, to make delicious, healthy meals, designed using easy to follow recipes and meal plans, to keep your body acid free while maintaining excellent health for years to come. Killing Me Softly From Inside is not just another medical self-help book, it may very well be a prescription that can one day save your life.